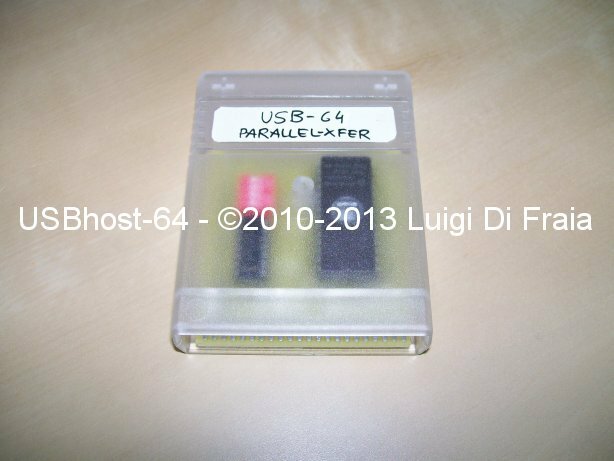 USBhost-64 is a hardware interface that adds USB host capabilities to the Commodore 64, thus making it possible to access USB flash drives at up to 16.42 kB/s for file read/write purposes. The other good news are that FAT-16 and FAT-32 are both supported. Last updated on the 21st of February 2015. 2013/09/27: Benchmark tests of the parallel interface after code optimization measured a throughput of 16.42 kB/s during write! BASIC programmers should use the BASIC extension: UINIT, USAVE, etc. No device number is assigned to USBhost-64. My USB Kernel is alone responsible for all access to a single USBhost-64 device. CBM Kernel routines are simply not used for USB access and therefore do not need to see a new device number to pass control to my USB Kernel. In this way, I can keep the two Kernels distinct and I don't have to give custom ROMs to users in order to change their CBM Kernel ($E000-$FFFF) into something that understands new device numbers; nor I need to change system vectors to point to code that wraps CBM Kernel routines. The above list is given for reference purposes only. I personally tried USBhost-64 with a card reader and with 3 flash drives without issues. USB-BASIC is the easy way to take advantage of the USBhost-64 interface. It integrates into the standard CBM BASIC seamlessly and new commands are available both in program and direct mode. There are tape, disk, and cartridge versions available so users can take their pick. I personally enjoy running USB-BASIC from my EasyFlash cartridge, but sometimes I have to load it from a TAP file using DC2N especially when I need to use my Action replay VI cartridge at the same time. 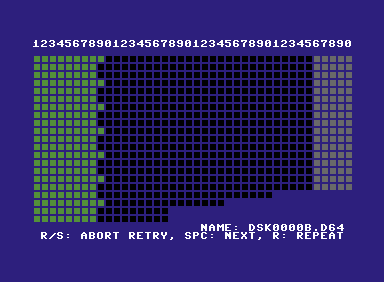 Because of the transfer rate achievable with the parallel version and because of the amount of RAM available for buffering, I wrote a tape dumping software (in assembly) for the Commodore 64, a la DC2N. 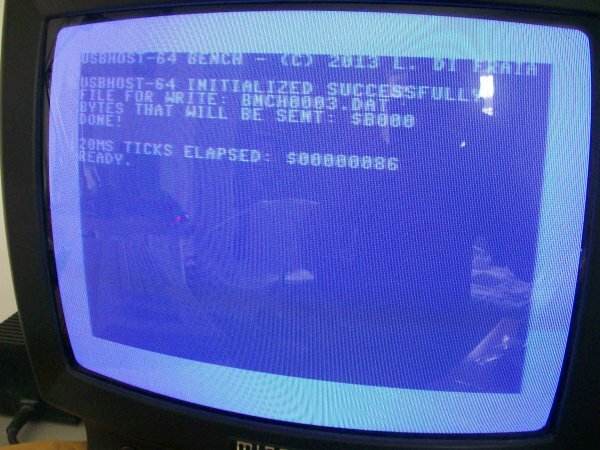 Recent tests (Sept 2013) have confirmed that 16-bit dumping is feasible and reliable on the Commodore 64 thus making this tool somewhat valuable! I also wrote a tape mastering program (in assembly) that writes TAP files back to tapes. I am also re-writing a tool (in assembly only this time) that uses the serial version of the device to make D64 images (free time allowing). I also wrote a Koala Painter viewer and a slideshow player (in assembly) that can be used to play full-screen animations or presentations. It's best suited for slow-motion animations when used for full-screen hires, but things become quite faster for smaller regions. Finally I am writing a Commander-like tool in C using cc65, USB-Commander, that can be used to explore the USB drive contents, copy files to disk, preview text files and pictures, etc. 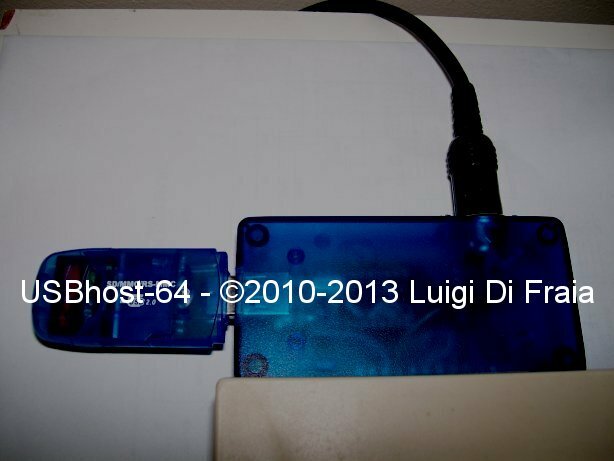 A number of people have shown interest in USBhost-64 so I am looking at taking pre-orders and producing a batch. Of course, it will only allow serial transfer at 1.2 kB/s. The API will be documented in order to let developers take advantage of USBhost-64 in their own software. Comments? Feedback? 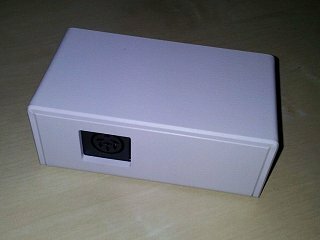 If you are interested in a USBhost-64 device, let me know: if enough people are interested I might consider producing a batch. 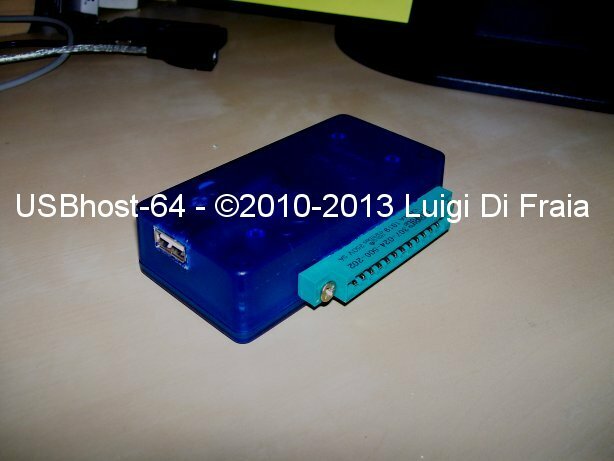 The total cost could be around 45 GBP - 60 Euro, for an average batch of the parallel version with a nice enclosure (that does NOT include the cartridge: you would only get the .CRT file to use with your existing cartridge, e.g. EasyFlash). Pre-ordering will be soon available at this page, so keep checking for updates if interested! Back to my C64 Section. Back in April 2010 I was attending Breakpoint 2010 in Bingen Am Rhein, Germany. There, among several modern PCs one could easily spot a few Commodore computers with people actually developing some code, pixellating some picture, and the Metalvotze guys watching a pron movie on a Commodore 64. Long story short: there are people who keep using their Commodore 64 for all sorts of creative work. Nice, isn't it? Over time several guys have designed and made all sorts of add-ons for the Commodore 64 to make using it a more enjoyable experience nowadays. That's 25+ years after it first came out. I've probably been a voice out of the chorus with my DC2N project: something that can play back tape ROMs at the same painfully low speed as the original ones did. That's great nostalgic stuff for those who enjoy sitting back and watching a game load, listening to its load music, and so on. Not much of interest for people in the development area though. Well, DC2N made the task of creating tape ROMs a very straightforward one; that was the original purpose anyway. I personally also used my DC2N to transfer files from PC, where my cross-development toolchain runs, to the Commodore 64. That occurred quite a few times during the devolopment I did for this project, of course. 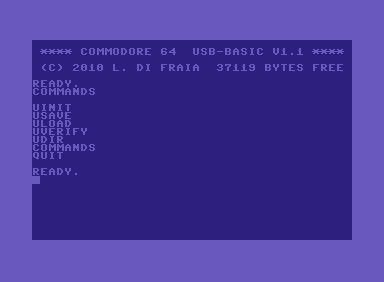 So that, after Breakpoint I felt I had been lingering for too long and had to move on, explore the available options in order to add some new "nice-to-have" feature to my Commodore 64: I personally always felt the need to have file transfer using simple, fast, and cheap means. 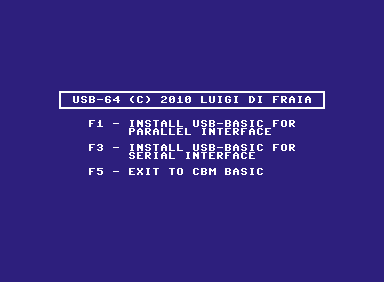 It was a rainy day in August when I had the idea: turn the C64 into a USB host and load/save files directly from/to a USB drive: the idea of USB-64 was born (it was later renamed to USBhost-64). It took a few days to arrange the hardware and write a driver in assembly. The first properly assembled prototype was going to appear on the 24th of August. Nobody had been informed about the progress, but a few close friends. One of the first things I realized was: I need this to be hassle free also for unexperience users. It also needs to look and feel like a genuine device from the 80's for what concerns the user experience. With a few "must have" enchancements, of course. Of course, the superset would need to be available in a simple way, possibly having it on a cartridge so that it's ready to use at startup, as enthusi suggested. 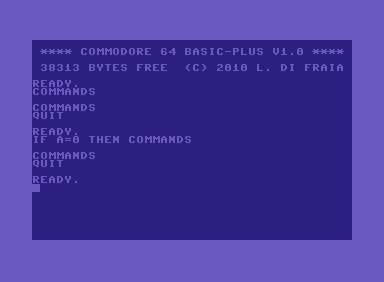 It was at that time that I started the BASIC-Plus project: a complete framework to extend the Commodore BASIC V2 with new commands and, why not, functions. It took a while to check around what was already available. Thanks to Fungus I came across the Transactor magazines which indeed presented an interesting framework for doing exactly what I needed. However, it showed a few features that I thought I could not live with: non BASIC-style tokens, and redefinition of IF (with the added bonus of ELSE, though). So that, I started working my way through the BASIC and Kernel ROMs and looking for other software here and there. I eventually came to the solution I knew I would have liked. On the 28th of August I did my biggest CVS commit of the whole framework, which included by default two new BASIC commands: COMMANDS and QUIT. 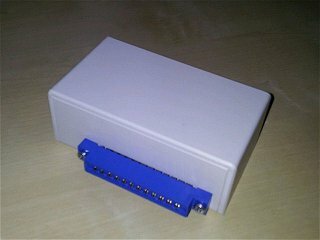 Everything else is up to the programmer who wants to extend the CBM BASIC, including myself when working at USB-BASIC. It took 33 seconds to complete without disabling interrupts or blanking the screen. Well, not too bad for a serial transfer. With interrupts disabled and the screen blanked, I later tried the same benchmark test and ended up with roughly 31 seconds. That's 1.2 kB/s transfer rate. Not too bad, but not too good either if you want to handle big files or stream from/to the USB drive. I went back one step and designed a parallel interface. Unfortunately, this meant more I/O lines required on the Commodore 64 side; so that I had to borrow three from its Serial Port. This time it took less than 4 seconds to complete: 9.5 kB/s about. That's less than half the time it takes for the Action Replay VI fastload to save the same amount of data to disk. Quickly enough I wrote the code to get a whole BASIC extension that was offering basic disk access capabilities seamlessly. A few years after the above speed measurement, I decided to set up a proper tool for throughput measurements. The simplest thing I could think of doing was to measure times on the Commodore 64 itself, thus interfering slightly with the test, but not a big deal. That's 16.42 kB/s. Is there room for improvement? Yes, there is. The driver and the software that sits on top of it are far from being heavily optimized. This could be pushed a little bit more, if wanted. I flashed the cartridge version of the handling software on my blank EEPROM, thanks to Dirk, a colleague from which I borrowed an UV eraser and an EPROM programmer. Other users will be able to flash the new ROM into their preferred cart, e.g. EasyFlash. Over time USBhost-64 has been criticised in favour of IP network-based solutions. I honestly don't think these two belong to the same subject. I mean, USBhost-64 is a proof of concept put together in 2 weeks and during my free time (that means evenings and mainly nights) in August 2010. I learned a big deal of things while working at this project, including the CBM BASIC interpreter and Kernel code style, which was great. 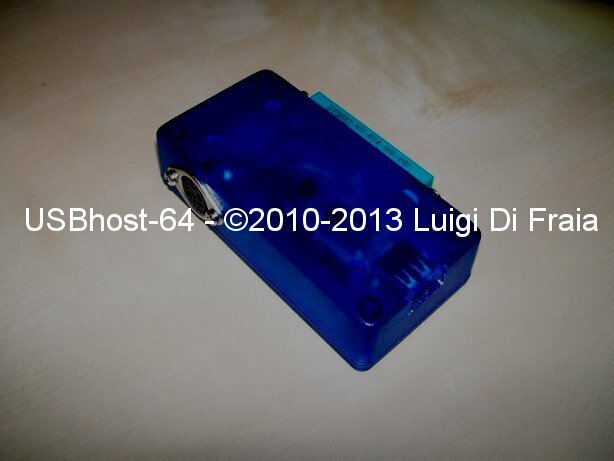 For me, USBhost-64 is more of a proof that with some motivation, enthusiasm and the right information one can achieve things that were not thought of up to that point. All images, files, and text on this page are Copyright ©2010 Luigi Di Fraia. All Rights Reserved. Use of the material provided by means of this page is prohibited without the explicit permission of the owner.